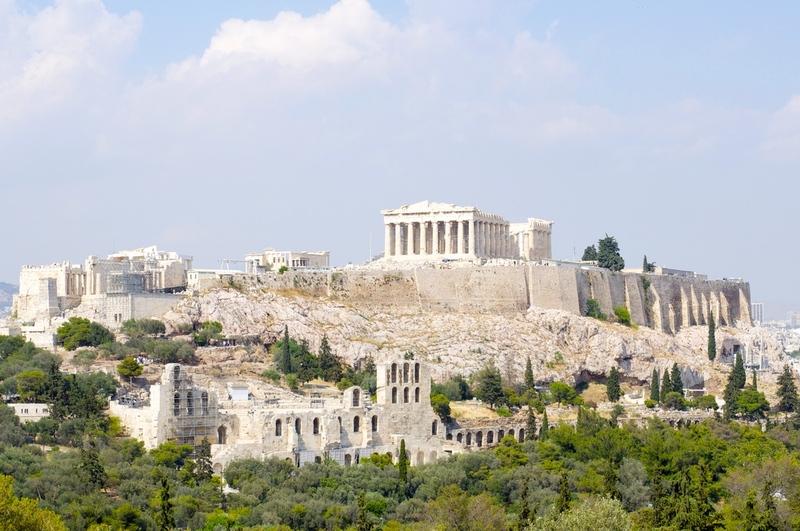 The essential guide where you will find the highlights of Athens. The Acropolis is undoubtedly the most recognised and photographed tourist attraction in Athens. Sitting high up on the hill the Acropolis presides proudly over the city. 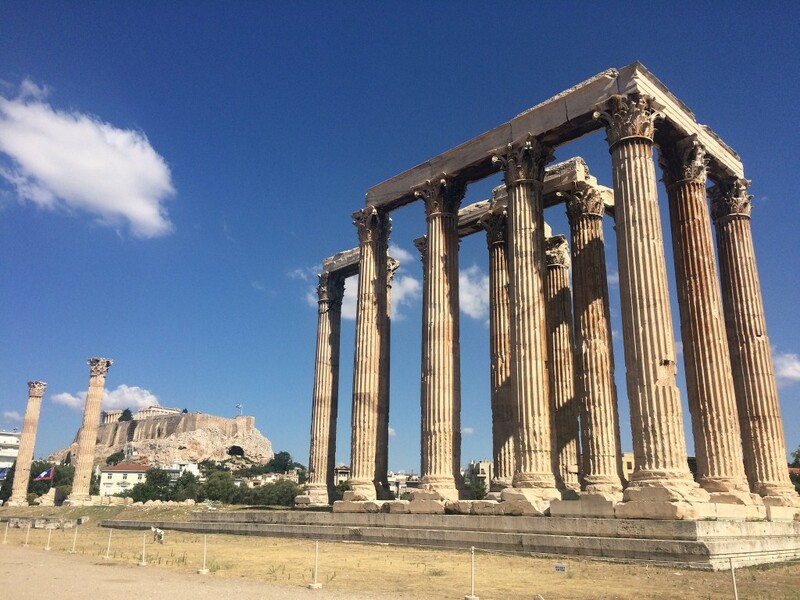 Visiting the Acropolis gives a great insight into the ancient world of Greece and should not be missed, highlights are the imposing Parthenon and the Erthechtheion. The Acropolis is a large expansive area that also incorporates a number of other must see sights at ground level. Be sure to make a visit to the ancient theatre of Dionysos, the Odeion of Herodes Atticus and a number of other sites located outside the main attraction. Allow most of the day to explore the area. Tip: Keep your entrance ticket and receipt from the Acropolis as it covers entry into other ancient sites. I was able to use my ticket from the previous day to get into the Ancient Agora. 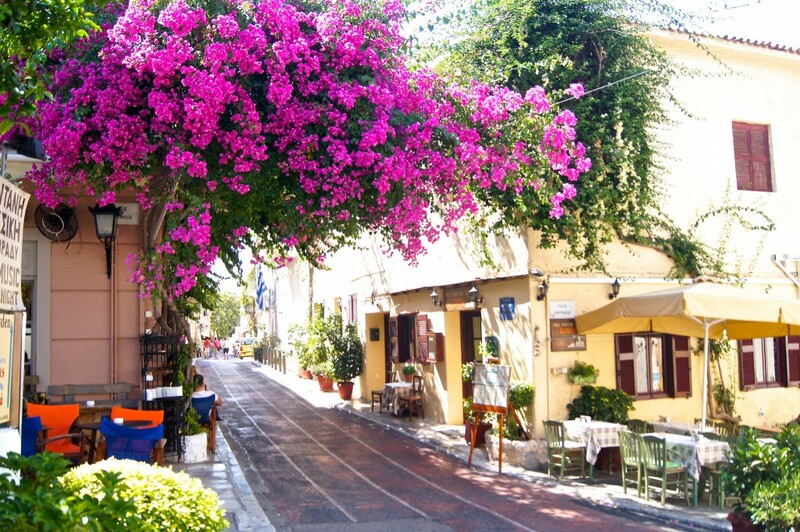 A visit to Athens isn’t complete without walking around this delightful area. Filled with cafes, restaurants and wine bars that spill over into the street. People sitting on steps sipping wine, dining alfresco and laughing with friends makes for a fabulous street vibe. There are also all types of shops, interesting buildings and a general good place to wander about the little streets or just sit and soak it all in. 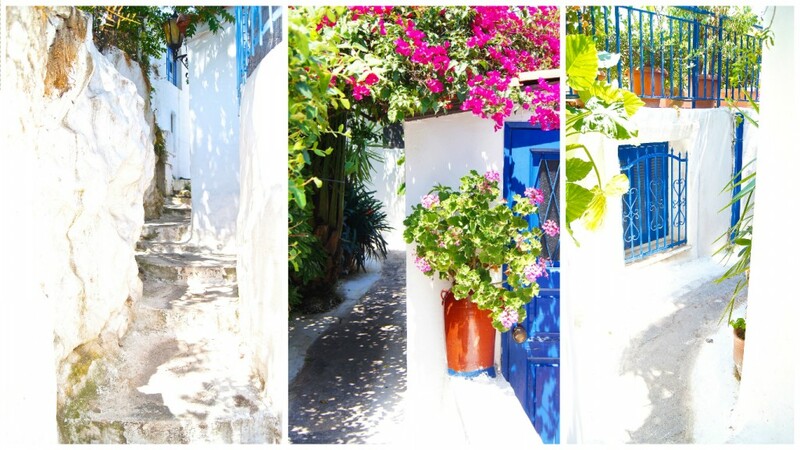 This charming little area is reminiscent of the Greek Island homes, complete with little lane ways and busts of colour. Anafiotika is a small area located at the bottom of the Acropolis and many tourists don’t realise it exists. If you are not fortunate to travel to the Greek Islands then pay a visit to this suburb that will give you a little taste of Island life. If you’d like to find out more on this area, have a look at my blog post on Anafiotika. 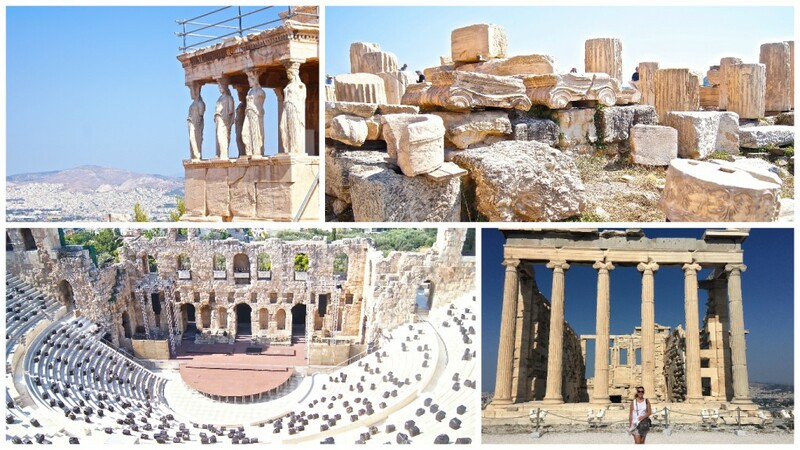 Including the Temple of Olympian Zeus, Roman Baths, classical houses and a section of the ancient city wall. Hadrian’s arch is located on the perimeter. The Temple of Zeus was built in 131 AD by the Roman Emperor Hadrian. It has only 16 of the original 104 columns standing. Each is 17 meters high. It once had a gold and ivory statue of Zeus. You cannot enter the temple but you can get some great photos of the temple with the acropolis in the background. Across to the other side of the park from the Olympieion you will find yourself in the National gardens, keep wandering to the top of the park, cross the road and you will see the Original stadium where the first Olympic games were held. The site has had a stadium located there since 330 BC with the original stadium constructed of wood. The current stadium was built in 1869. On the way to the Temple of Zeus you can pass through Hadrian’s Arch. 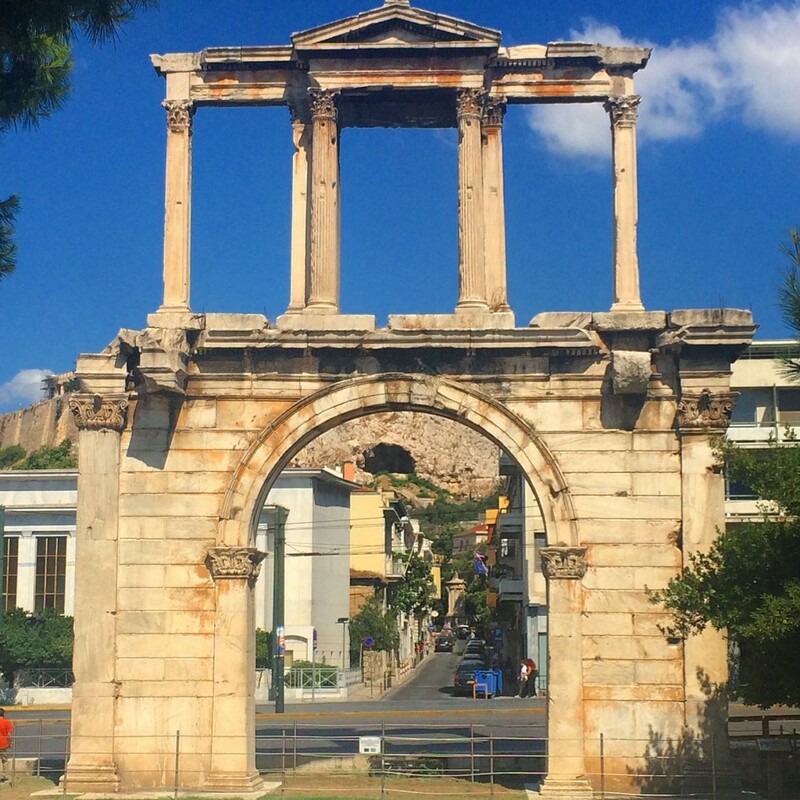 The arch was built in honour of the emperor Hadrian after his construction of the temple of Zeus. The marble structure stands at 18m tall and 13m wide and has inscriptions on both sides. To the West to the acropolis it says “This is Athens, the city of Theseus” on the other side to the East says “This is the city of Hadrian, not Theseus”. This is quite a large site of archaeological significance, you can easily spend quite some time in this area just wandering around. 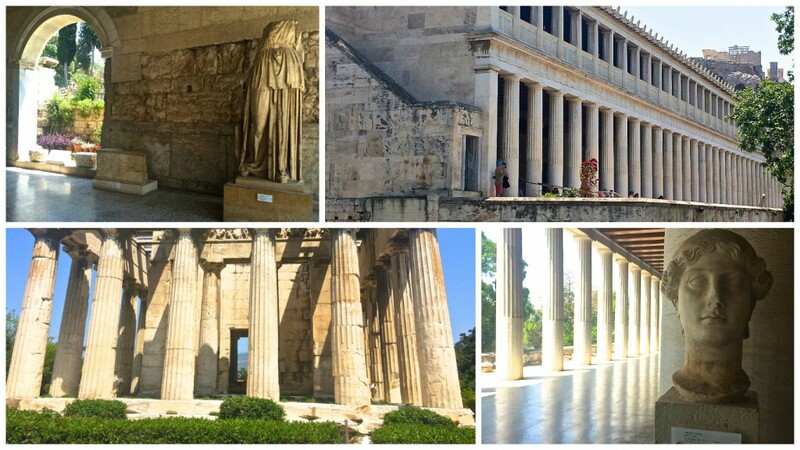 It was a centre for all things going on in Athens, culturally, politically and religiously. What to see here is the Temple of Hephaistos built in 460-415 BC. You are not able to enter the building but the outside shows how well preserved the structure is. Keep an eye out for the tortoises in the garden surrounding the buildings. The Attalus Colonnade houses a museum of artefacts that were found on the site, statues of important figures feature throughout the two story building. The area itself is very green, having you feel like you are wandering through a park, that just happens to be dotted throughout with ancient relics. If you are visiting during summer, it does get very hot. At the top end heading toward the acropolis you will find a vending machine with the cheapest bottles of water in Athens. Adrianou Street is located across from the Ancient Agora and is a great, lively area filled with restaurants and little market stalls selling along the road. Competition for restaurants is healthy as each host will try and get you to come inside their restaurant and take a seat. I settled on a restaurant called Ciccus, I said hello in Greek – Kalimera and funny enough they could have sworn I was Greek! We practised a few words and then I was shown to a table. The hospitality of the Greeks is really fantastic, they want you to be happy and boy do they feed you! When I sat down I was offered some complimentary breads, olives and a dip – yes complimentary! It nearly filled me up before my main meal arrived. I ordered my drink-of-the-moment a mojito which went down very nicely on a super hot day! I highly recommend this area to go and have a great lunch, dinner or snack at a budget friendly price. 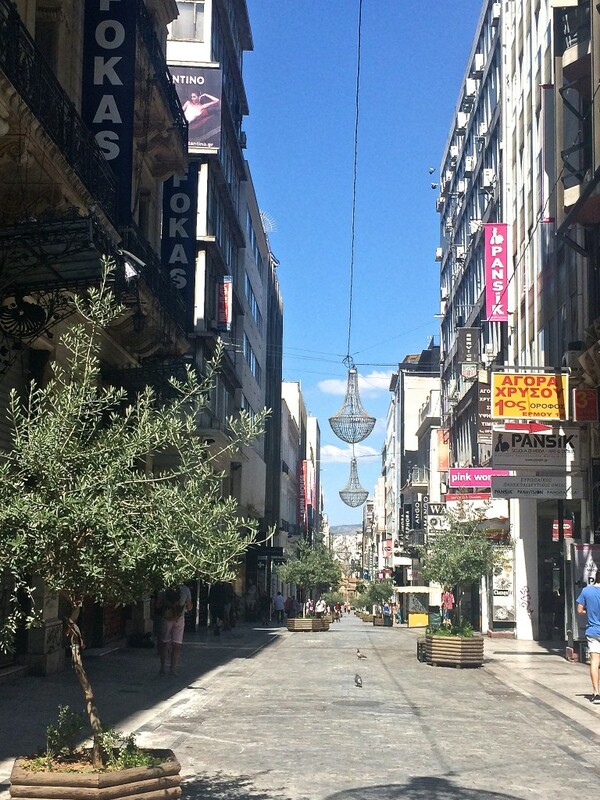 This is a shopping street starting from Syntagma Square. There are plenty of stores to keep shoppers busy with the usual global retail giants present amongst mainly boutique style shopping. Shops in this street are not open on Sunday. There are plenty of little cafes within this precinct. 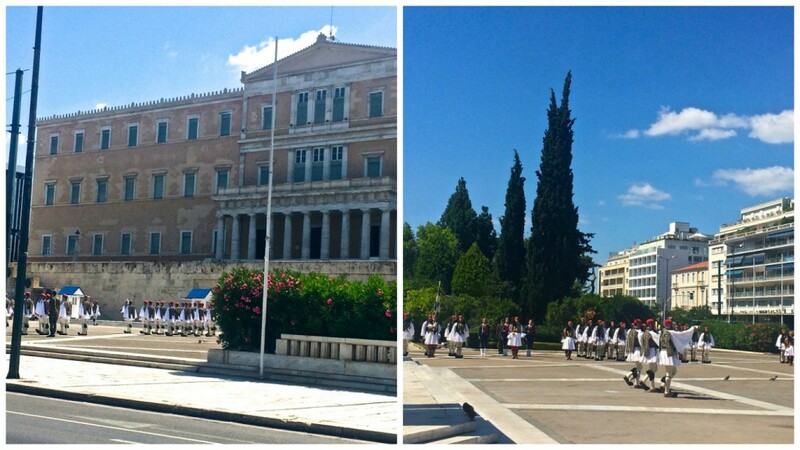 If you are coming by train you will emerge from the underground station right into Syntagma Square. It’s quite a busy open spaced area where you will find at the top Parliament House, the Monument to the unknown soldier and to onside a large park area called the national garden. 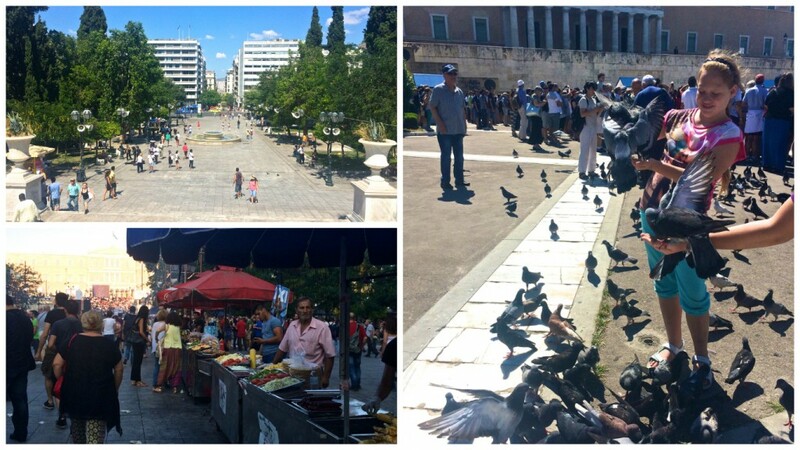 It’s a central area of Athens where many places can be reached in walking distance. 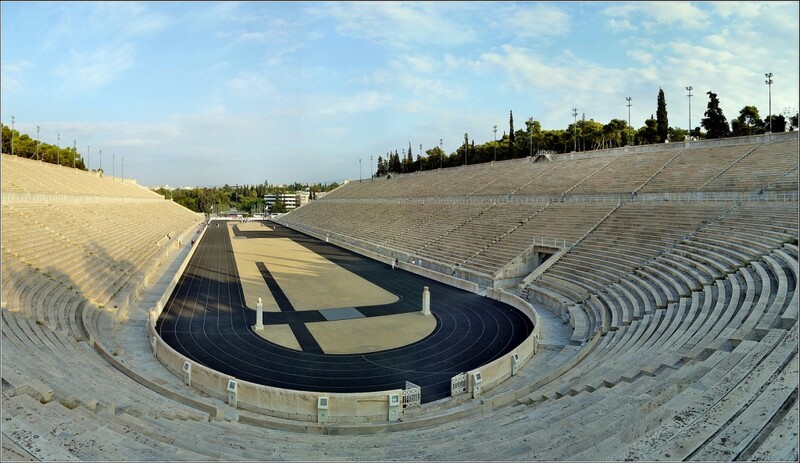 A walk through the National Garden you will find on the other side the original olympic stadium and if you walk along the perimeter you will find not too far along the Temple of Olympian Zeus. 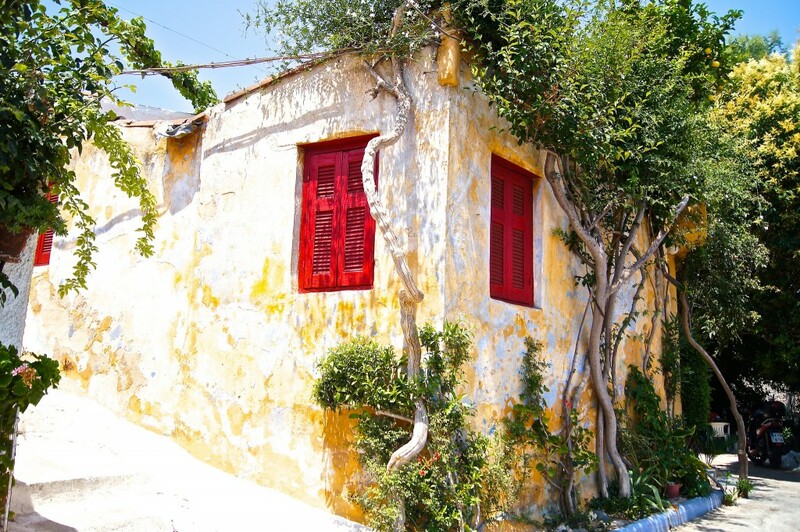 If you want to escape to a prettier side to Athens then have a look at Kifisia. Kifisia is the most affluent suburb of Athens with grand houses, fabulous cafes/restaurants, bars for the younger crowd and shops. 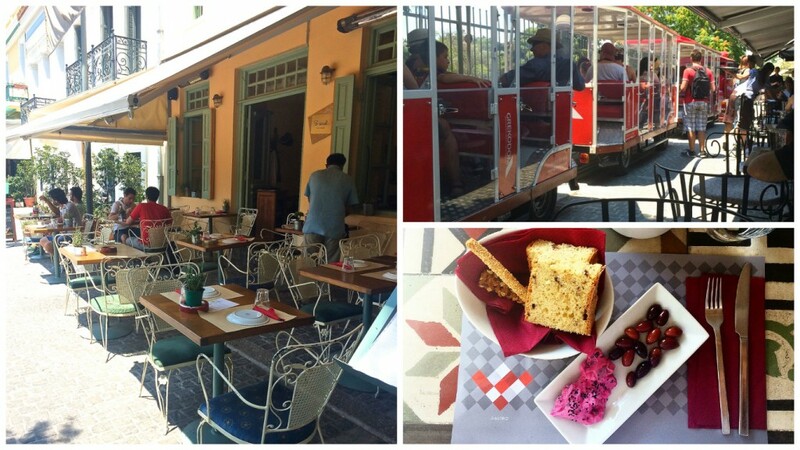 With tree lined streets, the restaurants, hotels are unobtrusive with the surrounds. It’s quite a lovely area to just drive around or walk. I was taken to Kifisia by my friend who grew up in the area and we went to a couple of bars. 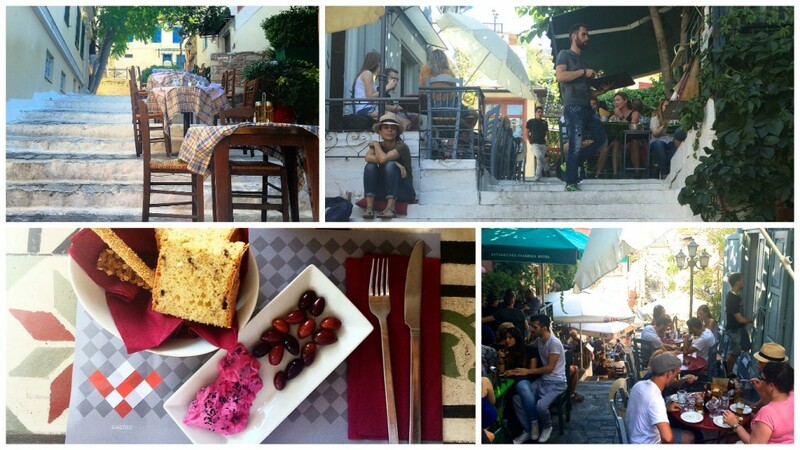 It’s exudes a relaxed pace than the touristy athens centre, with mainly locals out and about. Kifisia is about a 25 minute drive out of the centre of Athens or an easy ride via the metro or bus. There are luxury and boutique style hotels and it’s an ideal place to escape the hustle and bustle of Athens. 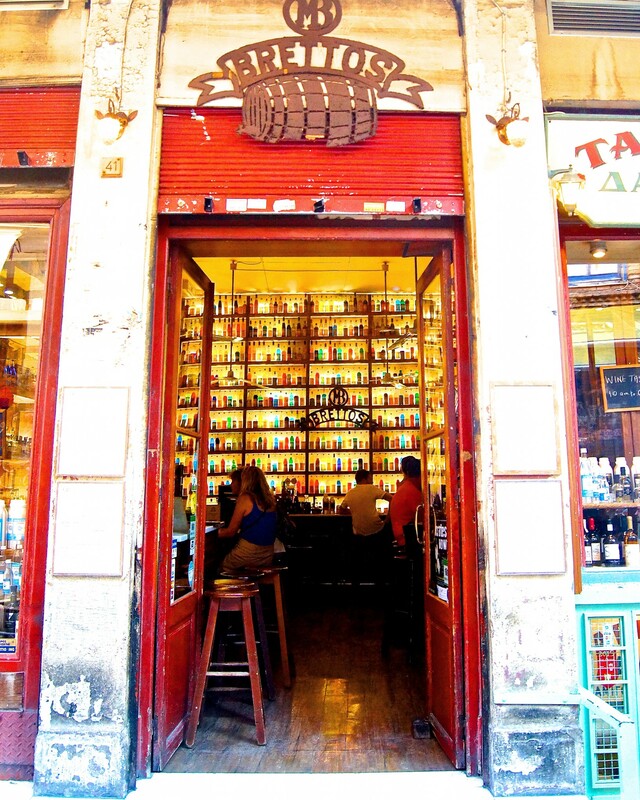 If you are a first timer to Athens then I would recommend staying in the tourist area of Plaka, where you can walk to all the tourist attractions. The best method for getting into Athens from the airport is via train. It can be a little daunting catching a train by yourself and not being familiar with the stops or the language can make you a slight bit uncomfortable (or extremely anxious in my case)! I grabbed a map and stood studying it, still not really sure where to catch the train. I watched as there were about a handful of people all wondering the same as me and the general consensus was to head to the entrance to the left. I got on the train and was relieved that this was going to the centre of Athens. My accommodation was in Plaka, so I got off at the Syntagma Station and walked my luggage a couple of blocks to my hotel. 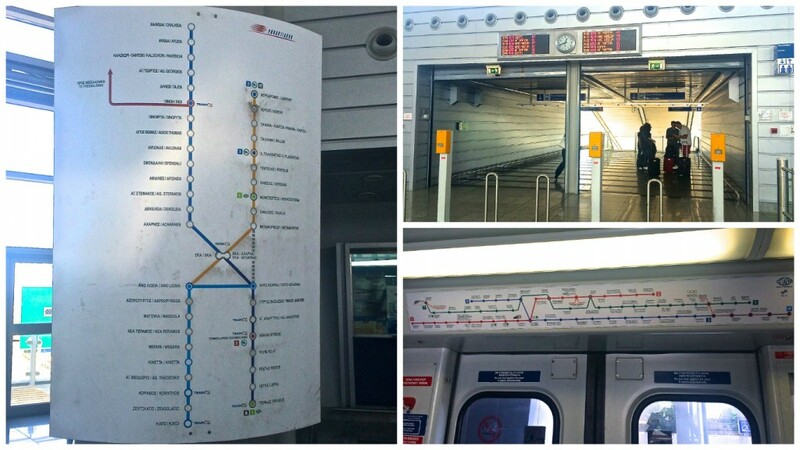 Above are a few photos of what to look out for if you are catching the train.